If you’ve discovered yellow mold growing in your home, you’re probably wondering what it is, why it’s there, and what to do about it. Household mold typically grows in damp areas of the home, such as bathrooms and basements. It can also be found under leaky sinks, around leaky window frames, and in attics or on ceilings when roofs leak. Mold can be found in many colors, including black, white, brown, green, and yellow. Aspergillus – Some forms of aspergillus appear yellow in color. It’s a very common household mold and can found virtually everywhere you’ve experienced water damage. Serpula lacrymans – Serpula lacrymans is sometimes referred to as house-eating mold because it feeds on wooden structures and literally eats away at them. 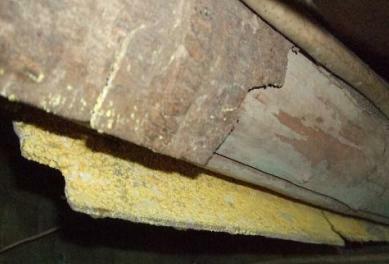 It has caused the deterioration of many old wooden buildings and can also destroy wooden furniture. Many health risks are associated with mold in the home, regardless of its color. Many people are allergic to aspergillus and may experience respiratory problems and an itchy rash or hives when exposed to it. Exposure to serpula lacrymans can also cause respiratory problems, including trouble breathing, coughing, sneezing, wheezing, and sore throats. See your doctor if you have symptoms you think might be related to mold exposure and let your doctor know if you have discovered yellow mold in your home. It may affect the prescribed treatment. If you do have mold-related illness, your doctor will probably tell you that you need to have all of the mold removed from your home as soon as possible in order to recover. Removing mold from the home can be difficult for a few reasons. First, mold often grows in places where it cannot easily be seen, like inside walls, under carpets, and inside heating and ventilation ducts. Second, mold spreads really easily, so when you’re cleaning up mold and removing moldy materials, it’s easy to accidentally scatter some mold spores in other areas of the home, making your mold problem worse. Third, those mold spores that get scattered about are easily inhaled, which can cause all of the health problems described above. Strict safety precautions must be taken in order to remove mold safely. Standard safety precautions include wearing protective gear, including disposable gloves, disposable hair and shoe covers, and an N-95 respirator mask; sealing off the work area with sheets of heavy plastic; and setting up negative pressure in the work area. If you feel overwhelmed by all those safety precautions, or don’t even know what negative pressure is, much less how to set it up in your work area, we recommend the ebook A Homeowner’s Complete Guide to Performing Mold Remediation by mold remediation expert Brian Turner. The easy-to-follow, step-by-step instructions, complete with photographs, will explain it all. If you aren’t up to all that work, or if you’d just like some professional advice before you get started, we recommend scheduling a free in-home consultation with a mold removal specialist. An experienced professional will come to your home, inspect the moldy areas, make sure you’ve located all areas of mold, and advise you about the work that needs to be done, including the necessary safety precautions. If you’ve been experiencing symptoms of mold-related illness, make sure you check with your doctor before attempting to remove the mold on your own; health care providers usually advise against it, because it can make symptoms worse. To find mold removal professionals offering free consultations in your area, just follow the link.